Hearing loss is the inability to listen things, partially or completely. It is also known as the Hearing Impairment or Hearing Disability. It means the problem in the part of one ear or ears. In other words problem in hearing the sound is known as hearing loss or hearing disability. This problem mostly occurs in the old age. 5 Major Hearing loss causes: There are many types, some of which can be treated by surgery or medicine. Hearing Loss Treatment: Hearing Loss Treatment depends on which type of audition Loss you are suffering from. If you are having the problem of this then you can refer to the following treatments. Hearing Aid: This is a device that is used by the people having the problem of audition loss. It consist of microphone, loudspeaker, amplifier and a battery. It increases the volume of sound that enters into your ear. So that you can hear the sound clearly. 1. Behind the ear (BTE) hearing aids:- BTE consist of two microphones that allows you to listen the sounds in the general vicinity or to focus on the sound that are coming from a particular direction. 2.Receiver in the ear (RITE) hearing aids:- RITE is similar to BTE but it is wear behind the ear. It is connected by a wire to a receiver located within the ear canal. It is less visible in comparison of BTE. 3.In the ear (ITE) hearing aids:- ITE is just like an earmould. It fills just outside area of an ear canal and the opening area of ear canal. The working parts of ITE are inside the shell. 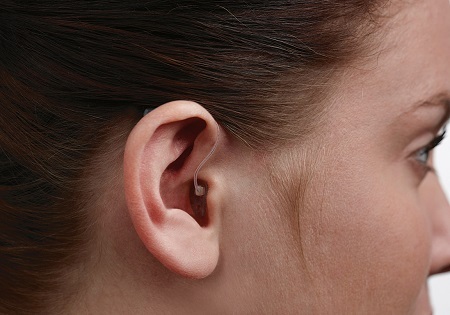 4.In the canal ITC) hearing aids:- ITC fills the outside area of ear canal. It is visible. 5.Completely in the canal (CIC) hearing aids:- CIC are even smaller. It is less visible in comparison of ITE or ITC hearing aids. 6.Body worn (BW) hearing aids:- BW having a small box with a microphone. You can put this box into your pocket or it can be clipped to your clothes. A lead connects the box to an earphone, which deliver the sound into your ear. 7.CROS/BICROS hearing aids:- CROS pick up the sound from the side that does not have audition and transmitting them to the ear that is able to hear. BICROS work similar to the CROS aids, but they amplify the noise. This noise enters into the ear that is able to hear. This type of aid is very useful for the people having some audition loss in one year and don’t have hearing in other ear. 8.Bone Conduction Hearing Aids (BCHA):- Bone conduction is useful for the people having Mixed or Conductive audition loss who can’t wear a conventional type of aid. Bone Conduction aids vibrate in response to the sounds going into the microphone. 9.Bone Anchored Hearing Aids (BAHA):- BAHA transmits the sound directly to cochlea by vibrating the mastoid bone. A minor operation is needed to fix a screw to the skull, on which the aid can be clipped on and off. 10.Middle ear implants:- These devices are the surgically implanted devices. These are attached to the audition bones and make them vibrate. 11.Disposable Hearing aids:- The battery inside a disposable hearing aid usually lasts for about 12 weeks, after which time the hearing aid is thrown away and replaced. 12.Cochlear Implants:- Cochlear implants are very small devices . These devices are fitted under the skin behind your ear during surgery. 13.Auditory brainstem implants:- ABI is used when there is a problem with the nerve that transmits the sound to the brain. 14. Lip Reading and Sign Language:- People with this problem watch a person’s mouth movement while they are speaking, to understand what they’re saying.